These Cherry Cheesecake Bars are super easy to make, the hardest part is waiting for the cheesecake to chill in the fridge. 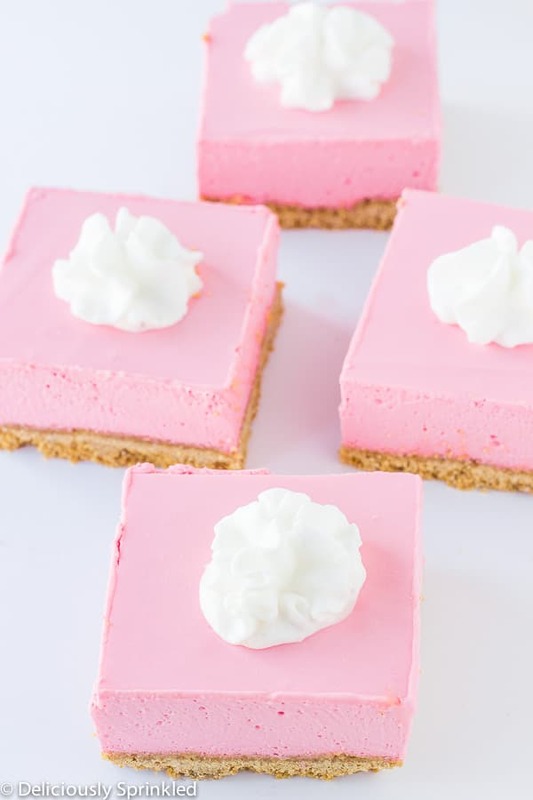 I love making these cheesecake bars in the summer months, when I don’t want to be baking something in the oven for hours and heating up our home. Although, these cheesecake bars are technically no-bake cheesecake bars, I did bake the graham cracker crust for only about 10 minutes, because I like the crust to be a little more sturdy when it’s baked and it adds an extra delicious crunch to these bars but if you don’t want to turn on your oven at all, no worries you do not need to bake this graham cracker crust if you don’t want to! 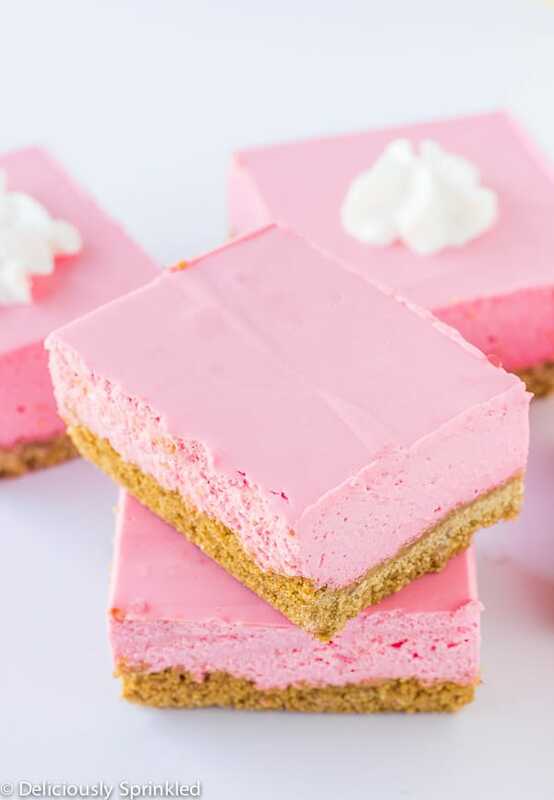 I will definitely be making these Cherry Cheesecake Bars more than once this summer, they were delicious! ✔ To make it super easy for you to cut these bars into squares, line your 13×9 inch baking pan with aluminum foil, leaving enough overhang on the sides and spray the foil with non-stick cooking spray. Once the cherry cheesecake bars have chilled in the fridge for at least 4 hours or until set, lift the bars out of the pan and folding down the aluminum foil sides. Then use a sharp knife to cut these bars into squares and enjoy! ✔ When mixing the cheesecake mixture, it might look like the cheesecake mixture is going to be too runny. But don’t give up, keep on beating the cheesecake mixture until it has thickened. Trust me, it’s like magic all of a sudden it will start to thicken. ✔ You can substitute the cherry gelatin flavor with your favorite gelatin flavor. 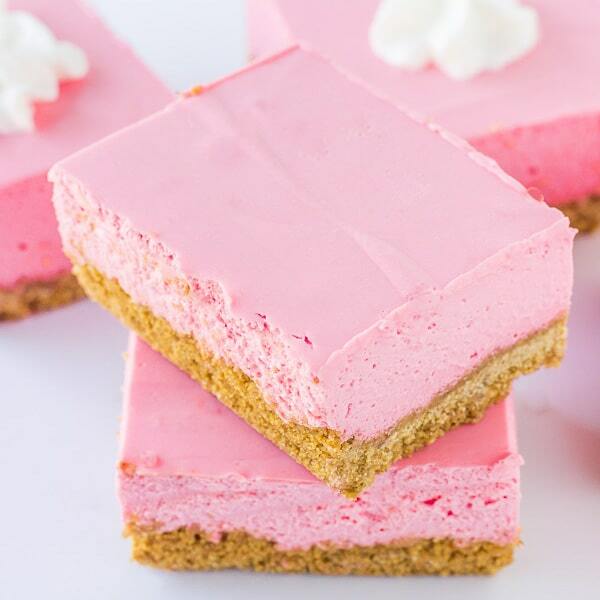 I love to make these as strawberry cheesecake bars and top them with sliced fresh strawberries, the options are endless when it comes to these cheesecake bars. PRE-STEP: Preheat oven to 350F degrees. Line a 13x9 inch baking pan with aluminum foil and spray with non-stick cooking spray. Set aside. STEP 1: Using a food processor, pulse graham crackers until crumbly. Mix in sugar and melted butter until crust forms. STEP 2: Press graham cracker crust into prepared pan. Bake for 10 minutes. Let crust cool before topping with cheesecake mixture. STEP 3: In a small saucepan, boil water. Add cherry gelatin mixture to a small bowl. Add boiling water to gelatin mixture and stir until completely dissolved. Let cool before adding to cream cheese mixture. STEP 4: Using a hand mixer or stand mixer with paddle attachment, mix cream cheese and powdered sugar until light and creamy. STEP 5: Add cooled cherry gelatin and heavy whipping cream and mix until completely combined. TIP: The cream cheese mixture will start out runny, but don’t give up. Keep beating it until it thickens. Also, if your using a stand mixer switch to a wire whip attachment. STEP 6: Pour cheesecake mixture on top of cooled crust. Place in fridge for at least 4 hours before cutting into squares. Top with whipped cream and enjoy! Ive popped in for the recipe for the 3rd time to make it for the 3rd time!!! We just love it! Since we dont really like crusts I just make the mixture in dessert glasses and its really pretty! Today Im topping them with a cherry-pie-topping cherry. Was even thinking to blend some in to the mixture! THANKS FOR THE RECIPE! This recipe looks awesome, especially because I can substitute whatever flavor of gelatin I want! Oh, the possibilities … lime? lemon? strawberry? Can’t wait to make these with my daughter tomorrow! It’s hard not to love these! Cool, creamy, and bursting with sweet cherry flavor, I’m in love! These turned out perfectly Jenn!